Your first job as a parent sounds so simple: feed the baby, as much as possible, ideally breastmilk. Hugo & I soon discovered it was anything but simple. Four years ago I brought my first son home from the hospital, fully committed to doing this job right. But in those first few weeks I watched him lose weight, first a little and then a lot, despite the fact that I was nursing him as much as I could. It was a dark time for me. I got conflicting advice from doctors, nurses, and lactation consultants. I thought data could help, so I downloaded a bunch of apps. It turned out all of them were created by men who, while very well-intentioned, had never personally breastfed a baby. In the end I resorted to a spreadsheet. This was my first realization that as a parent, I was now a second-class citizen in the world of technology. At first it was a culture shock — my late-night Googling sessions took me back to the 90s, into a world of sluggish websites, mailing lists, and phpBB forums, all of which barely worked on mobile devices. Then something occurred to me. After almost 10 years in technology, I could count the number of parents I had worked with on one hand. Of course no one is building good tech products for parents; most people in tech don’t even know any parents. And when startups do address this market, they suffer from a lack of diversity and overlook problems faced by people who bear children and lactate. Baby’s Day was designed to be used one-handed. Appropriately, it was also written one-handed. That’s when I started working on Baby’s Day, intent on building the tool I wished I’d had in those early days. Everything about the product was informed by my experiences as a mother. I designed the app to be used one-handed. I used controls that can be operated with one finger instead of keyboard text entry. I built a feature to gently ask you to adjust your log if it seems like you fell asleep during a nursing session. Screenshots from Baby’s Day for iOS. 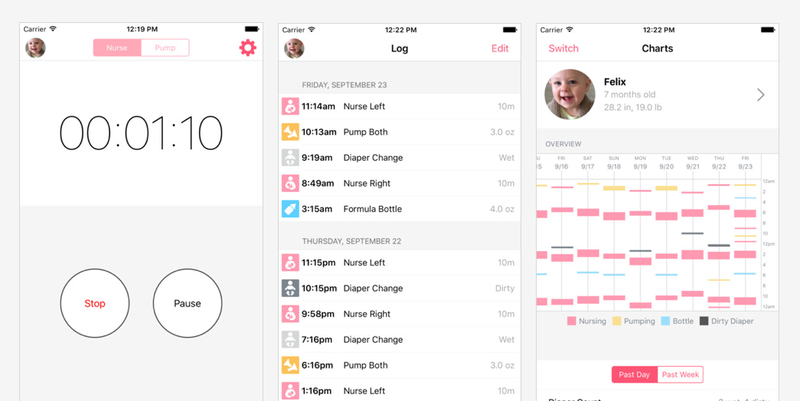 And 18 months later, when I brought my second son home from the hospital, I used my own app. We breastfed for over a year. Four years have passed since I built Baby’s Day, but thousands of parents still use it. The average person who installs the app opens it 180 times. I could see that this humble utility that I made while my son was napping connected with an active and loyal audience. The insight that maybe the tech industry has a blind spot when it comes to this audience is a big part of why I decided to join Sara in founding Winnie. Fewer and fewer families have a full-time parent out networking with other parents; more and more of them are turning to the Internet to find the information they need to be successful as caregivers. The good news is that modern knowledge systems can be very sophisticated, and the technology to build them is easily accessible. With all the tools today’s developers have at hand, we can get down to the business of creating, organizing and curating this knowledge at scale. All it takes is someone to acknowledge the problem and put resources into solving it. When information can change not just one life but an entire family, when it can help not just this generation but the next, that’s when you know you have a truly interesting opportunity at hand. Afternote: Both Sara and I struggled with feeding early on, and we know it can be a huge source of stress for new parents. We recently compiled a guide to feeding & pumping on the go that contains the information we wish we had. Please pass it along to anyone who could benefit from it, or let us know if you have a useful tip to add. Public spaces are nursing spaces.